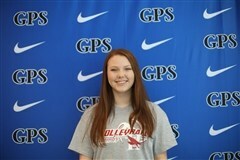 GPS's Emma Moore has signed to play volleyball for Huntingdon College in Montomgery, Ala.
Moore arrived at GPS her junior year prepared to make a name for herself on the volleyball court. Previously she played varsity for two years at Gordon Lee High School and was twice named a member of the Walker County Dream Team. “I’m truly proud of this girl,” said Alfie Dodd, former GPS Head Varsity Volleyball Coach. “She’s very skilled and has amazing court sense. She can serve the ball to any spot, distributes the ball to all hitters, and makes everybody better. I think Huntingdon will be truly pleased with what she gives to the team. Since playing as setter for the Bruisers, Moore has won an all-region award and was named MVP. She has 1,222 career assists and served as team captain her senior year as well as the team representative for Bruiser Leadership Committee. Moore plans to study biology while at Huntingdon College on a pre-med track.